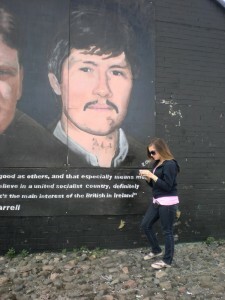 Devon Novotnak '11 records the geographic location of a mural in West Belfast. Two Peace and Conflict Studies students, Samia Abbass ’11 and Devon Novotnak ’11, have traveled abroad with the college’s Northern Ireland semester over the past academic year. While they were there, they participated in a research project co-investigated by Prof. Lee Smithey (Swarthmore College) and Prof. Gregory Maney (Hofstra University). With the assistance of Jayne McConkey, a resident of Belfast, Samia and Devon took photographs of over 250 murals, plaques, and memorials in West Belfast, an urban area deeply impacted by the Troubles. The mural mapping project uses geographic information systems (GIS) data to study change over time in the content and placement of murals and other public displays of ethnopolitical identity. You can read more about the project in a recent article in The Bulletin. From left, Taller de Paz co-founders Alex Frye '11, Deivid Rojas '11, Andrés Freire '11, and (front row center) Camila Leiva '09, with program facilitators from Conciencia Social/La Universidad Javeriana. Deivid Rojas ’11, Camila Leiva ’09, Alex Frye ’11, and Andres Freire ’11 recently received a Davis Project for Peace grant to develop the fledgling Taller de Paz (TDP) educational program in Bogotá, Colombia. They established the organization, whose name in English means “workshop for peace,” to empower displaced and disadvantaged Colombian youth to become devoted activists in their community through practical, artistic, and social education. The educational program is structured around four workshops (talleres) for photography/film, art, English/storytelling, and social justice. … read the full story in Swarthmore News. Congratulations to our graduation Peace and Conflict studies students! We wish you all the best, and we look forward to staying in touch with you in the coming years. You remain an important part of our program, and I am sure future students will benefit from your experiences. Conscientious Objection: Why Did They Refuse To Fight? Three conscientious objectors from three different generations and wars (World War II, Vietnam and Iraq) will share their unique and inspiring stories of conscience-led action. Why did they refuse to go to war? In the face of enormous pressure to do otherwise, what led them to do what they did? In every war, there have been Conscientious Objectors. For religious or ethical reasons, they take very seriously the injunction “Thou shalt not kill.” Why do some people examine their convictions and then refuse to become soldiers, despite broad popular support for military engagement? Come hear the powerful stories of the panel and understand what led each of them to reject a belief in violent combat, whether before, during, or following a war. Sponsored by the Peace and Social Action Committee of Providence Meeting. If this event interests you, you would probably also be interested in the Resources on Conscientious Objection in the Swarthmore College Peace Collection.